Spring Extravaganza Ocoee Trip posted! Kayak and canoe class dates are set for beginner,Trained Beginner, and Intermediate paddlers:June 15 – 16, July 20 – 21, August 10 – 11Recreational: June 8 – 9, June 15 – 16, June 22 – 23, June 29 – 30. We are accepting donations to the River Access Fund. 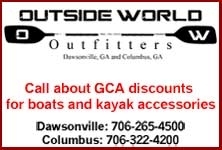 © 2019 Georgia Canoeing Assocation, Inc. All Rights Reserved.